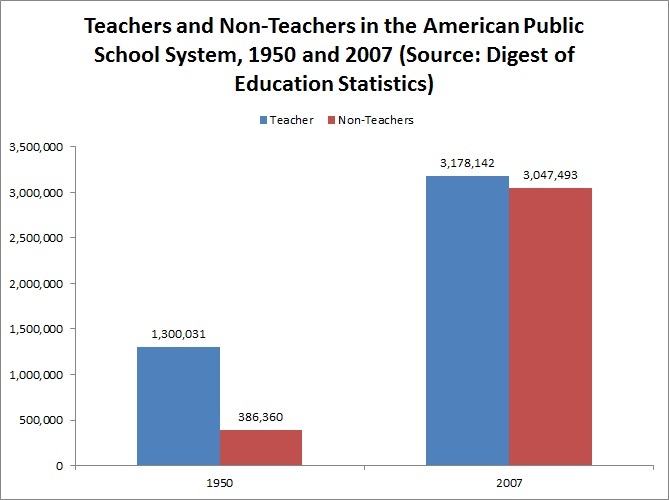 These three charts, all derived from National Center for Education Statistics Data, should fill all Americans with shame. This is our public education system, and all citizens bear responsibility for the often terrible results despite the infusion of massive taxpayer resources into the system. You can’t surround students with an ever-increasing number of adult employees without vastly increasing spending per pupil in real terms over time. The problem: it hasn’t worked for the kids in terms of improved learning. Occasionally some will attempt to serve as an apologist for this catastrophic social failure by attempting to argue that children are more difficult to educate today than in the past. In some ways, this is true. In other ways, however, children are easier to educate today than in the past. We eliminated lead paint and gasoline lead, for example, decades ago. Jay Greene and Greg Forster studied sixteen different factors in a Manhattan Institute study and concluded on balance that the “teachability” of children has improved rather than declined. Whether or not you agree with Dr. Greene, resources have increased dramatically. 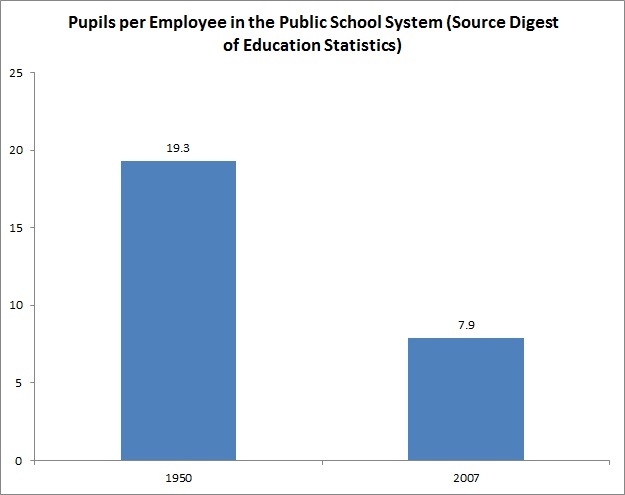 Who are the primary victims of Baumol’s disease in K-12 education? Without a doubt the answer is: poor and minority children. Daddy’s private tutor got me over Finland’s average score! 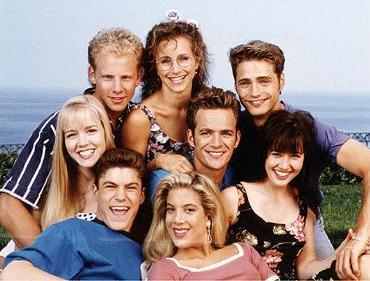 Congratulations 90210! If you pick out the wealthiest parts of America, it turns out that they can outscore national averages. No word yet on how well wealthy Americans compare to wealthy Koreans or wealthy Finns, but I think we know how an apples to apples would wind up. 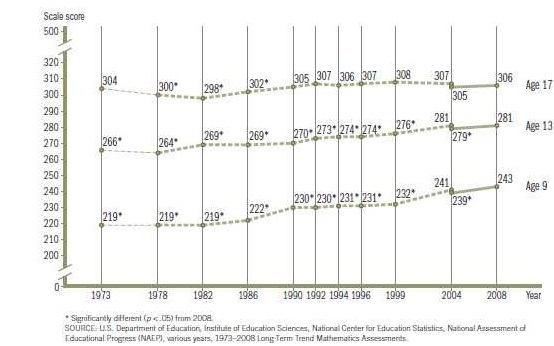 The far more important data from this study is contained in the next chart: American Black and Hispanic students score closer to the bottom scoring nation taking PISA (Mexico) than they do to American White students or to Koreans. It goes without saying that Mexico has a far greater poverty problem than the United States. 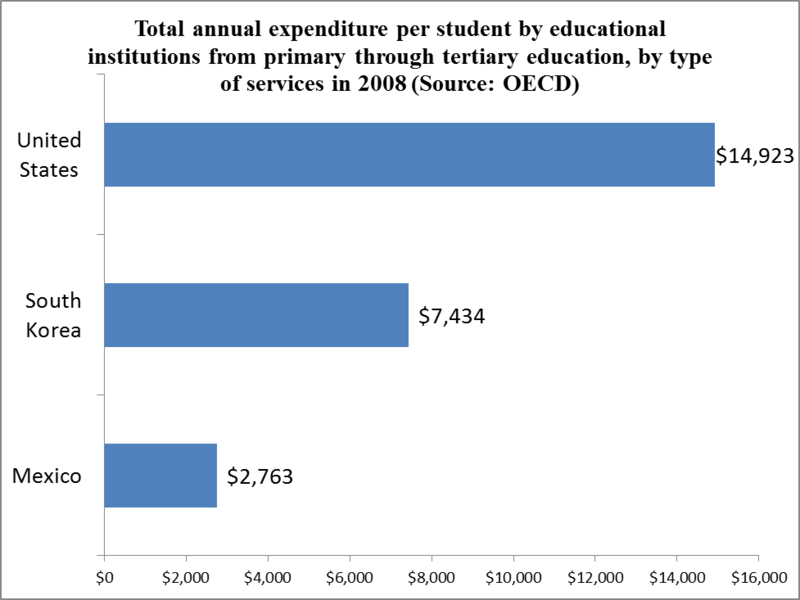 This fact is reflected in the differences in total spending per pupil. So with a far greater poverty problem and far, far less to spend per pupil Mexico manages to educate their students to almost the same abysmal level that American public schools manage for the average Hispanic or Black student. School leaders in Mexico can only dream of commanding the sorts of resources taken for granted in America, and would gladly exchange poverty problems with us. 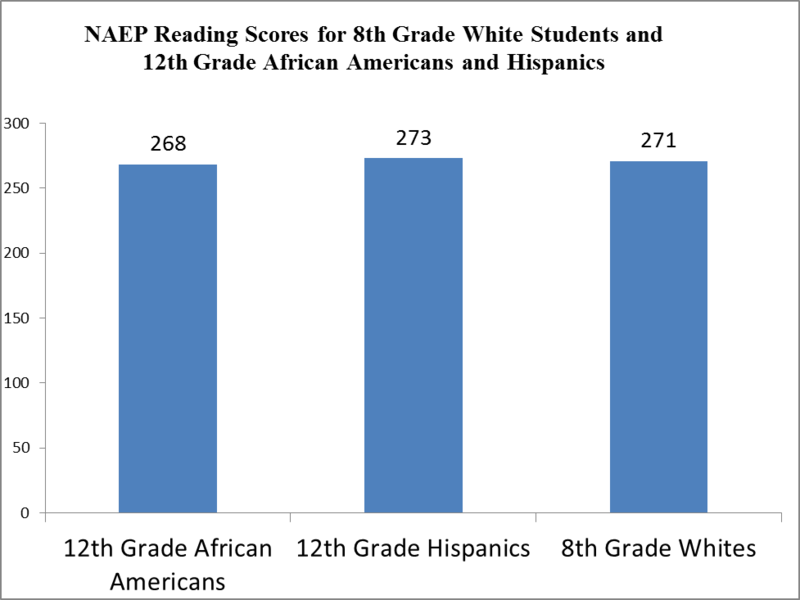 Below you see the same catastrophic American failure in the Long-Term NAEP data, showing on average, the average Black and Hispanic student in America has arrived in 12th grade with a level of academic attainment comparable to an 8th grade Anglo. If we were able to factor in dropout rates, this comparison would look even worse. All Americans of all philosophical backgrounds know that we can and must have a system of public schooling that does far better. American students and taxpayers want, need and deserve a system of schooling that does far more for those starting with the least. The ineffective use of the massive funding in the American public school system has very real victims. In our next exciting episode, we will explore how we got here, and what we can do about it. Dr. Matthew Ladner (@MatthewLadner) is the Senior Advisor of Policy and Research for the Foundation for Excellence in Education. He previously served as Vice President of Research at Goldwater Institute. Prior to joining Goldwater, Ladner was director of state projects at the Alliance for School Choice. Ladner has written numerous studies on school choice, charter schools and special education reform and coauthored Report Card on American Education: Ranking State K-12 Performance, Progress and Reform for the American Legislative Exchange Council. Missing from the description of Mr. Ladner is his twice being named by the National Education Policy Center for his shoddy work. Thus, he has been twice awarded Bunkum Awards, one titled, “If I say it enough, will it still be untrue?” and the other a Lifetime Award due to his faulty contributions. I never saw a degree in education but I do know he has his grad work in Politics. Oh, maybe that explains it all. He attends ALEC…case closed for me.